Pics A team of astrophysicists has announced a sighting of gravitational waves – formed in the first trillionth of a trillionth of a trillionth of a second after the universe as we know it blinked into existence. The breakthrough discovery throws enormous weight behind the famous inflationary Big Bang theory. The boffins must be expecting a call from the Nobel Prize panel in Sweden. "This is something that's not just a home run, but a grand slam," said Marc Kamionkowski, professor of physics and astronomy at Johns Hopkins University, in Maryland, US, today. He was speaking at a press conference to announce his team's results: "It's the smoking gun for [the universe's] inflation and it's the first detection of gravitational waves." 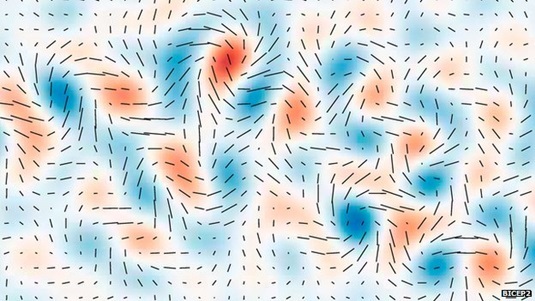 The waves, first predicted by Albert Einstein 99 years ago as a key tenet of his theory of General Relativity, are formed in the cosmic microwave background when massive objects like stars and black holes interact. The biggest gravitational wave, now observed, was formed 13.8 billion years ago as the universe suddenly snapped into being – a smoking gun for the Big Bang, the cosmic birth of reality as we know it. The team's work also supports the theory that in the instant after that moment, the expansion of space briefly exceeded the speed of light – the aforementioned inflation – and this caused ripples in the first light energy to exist. The inflationary theory of creation helps explain why we have detected temperature differences across the universe. The signal indicating the presence of gravitational waves is much stronger than expected, too. The boffins' evidence and papers on the discovery can be found here. “This has been like looking for a needle in a haystack, but instead we found a crowbar,” said co-leader Clem Pryke, the British-born associate professor at the University of Minnesota. For nearly the past decade, the team of scientists has been looking into the sky for evidence of these waves, using telescopes on the South Pole, where the air is clear and dry. These signals were picked up by the Background Imaging of Cosmic Extragalactic Polarization 2 (BICEP2) telescope, which uses micro-machined superconductors to pick up the incredibly faint traces of light. 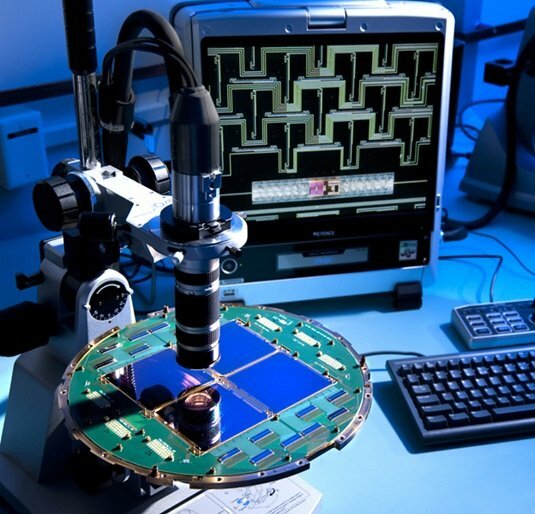 The light is polarized, and BICEP2 [full info] has a 26cm aperture and uses 512 NASA-manufactured printed antennas that collect polarized millimeter-wavelength radiation. For two years the telescope was chilled down to 0.25K in an attempt to pick up faint gravitational waves of B-mode polarization. "Our approach was like building a camera on a printed circuit board," said Jamie Bock, project co-leader and professor of physics at Caltech. "The circuit board included an antenna to focus and filter polarized light, a micro-machined detector that turns the radiation into heat, and a superconducting thermometer to measure this heat." After getting the first results in the team then spent three years going over its data to make sure that there was no other possible explanation for what they were seeing. They report a confidence level greater than 5 sigma, meaning the odds are less than one in 3.5 million that they are wrong. Sadly, that long checking process has left a lot of scientists somewhat out of pocket. In 2004 British bookmaker Ladbrokes offered 500-to-one bets that gravitational waves wouldn't be discovered by 2010 and so many scientists rushed to lay down money that the odds were cut to 10 to one. "As Carl Sagan said, extraordinary results require extraordinary scrutiny and these results are as extraordinary as they get, and will require the most extraordinary scrutiny," said Kamionkowski. "We must therefore wait before buying any tickets to Stockholm until these results are vetted by the community. If these results hold up then we've learned that inflation has sent us a telegram coded in gravitational waves and transcribed on the cosmic microwave background sky."